Betsy Davids is a book artist and writer who derives inspiration from her dreams and dream experiences. Betsy has been making and teaching book art since 1970. She is Professor Emerita at California College of the Arts (formerly CCAC). 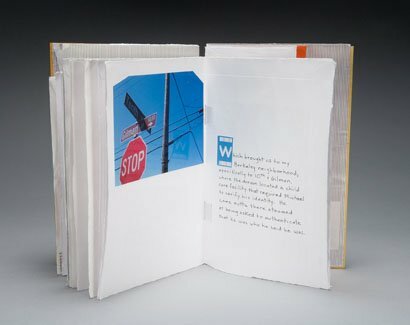 Her books have been exhibited at the San Francisco Center for the Book (SFCB) and the Center for Book Arts, New York. 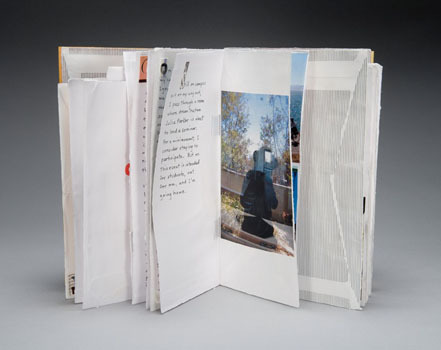 Her work is featured in The Century of Artists' Books (Granary) and other publications. On a daily basis, the external world brings me mail; on a nightly basis, an inner world brings me dreams. Predawn Postings : Nine Dreams explores this analogy. The handwritten texts come from my longterm dream writing practice, working with dreams from July 2007. The photographic images come from a psychogeography process, which is newer to me; for each dream I photographically documented a place or object from my everyday life that could be reminiscent of the dream. The book’s materials come from the daily mail delivery. 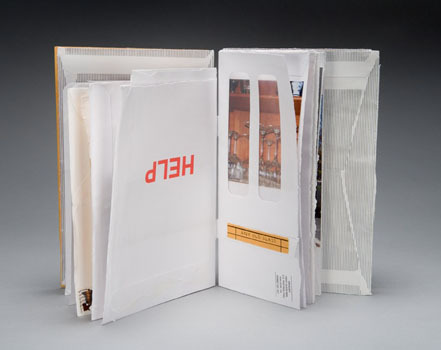 Pages and cover are constructed from the envelopes of bills, notices, and requests for contributions. Initial letters are cut up from the typographic bonanza of announcement cards. By tearing, unfolding, refolding, slitting, weaving, those ordinarily pathetic little daily heaps of paper waste are transformed into a book. The nine dreams in Predawn Postings cycle from my home to my college teaching workplace to my high school class reunion, bringing up transition issues of change, identity, new growth and new directions.